Shop Our Other Items >. 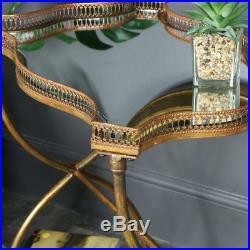 Vintage gold mirrored side cocktail display table antique French shabby chic. This side table is a stylish addition to your home. Finished in an antiqued gold finish to give a vintage appearance with a mirrored top. Perfect side/occasional table that will easily suit the living room or hallway. Perfect for a traditional or comtemporary style interior. The mirrored top will reflect the light to create a great effect and make the perfect display table for candles, ornaments or floral displays. This will also make the perfect cocktail table for dinner parties, serve your guests in elegant style. Cutout edging decorates the top of the table to add to the vintage appeal of this piece. This table will also look perfectly at home in the hallway. With metal framework in an antiqued gold finish and mirrored glass top. If you're looking to add a little more elegance to your decor or completely change your home style, you've come to the right place. We have an astounding range of furniture and home accessories that will allow you to furnish your home with love and add that uniquely personal touch. Material(s): Metal / Glass. 55cm x 68cm x 38cm (width x height x depth). Welcome to our MelodyMaison e-shop! We've been around since 2004, starting off as a one-woman, one spare bedroom band, we now have a super-duper glamorous warehouse and showroom near Doncaster. In those years we have become a leading retailer for shabby styled French chic, Vintage style, French boudoir and cottage chic Home Furnishings, Wedding decor and Home Accessories. Customer service is our number one priority, if you have a problem with your order or if you think we can improve anything, let us know and we will try and learn from it. We always treat my customers as I would wish to be treated myself. I personally take the most pleasure in sourcing and adding new lines to this website. I promise to add new products on a regular basis, so do keep visiting our site so there is always something new for you to see each time you visit. At Melody Maison, we hope you will agree we have lots of beautiful things! Sourced from around the world, mostly with a distinctly Vintage French feel, either that of a rustic chic look or of ornate but affordable grandeur. We are the UK's largest retailer of beautiful French style dressing tables. We have a fabulous team of dedicated staff all of whom are nice people who love being helpful and talking about our stuff! Please note this item may carry an additional charge for Scotland and Non-Mainland addresses, please ask. These terms and conditions do not affect your legal rights. 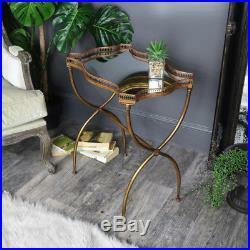 The item "Vintage gold mirrored side cocktail display table antique French shabby chic" is in sale since Friday, November 16, 2018. This item is in the category "Home, Furniture & DIY\Furniture\Tables\Side/End Tables". The seller is "melodymaison" and is located in DN11 8BZ. This item can be shipped to North, South, or Latin America, all countries in Europe, Australia.